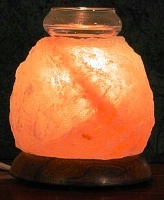 Perfect mood light for bedrooms, bathrooms or anywhere when you use your favorite essence oil. The hand-carved lamp is 3-4 lbs. and 5" tall. The glass dispenser is hand blown. UL approved 110V light fixture, bulb and switch.